FRANKFURT (Bloomberg) -- Auto parts supplier Continental AG said it's one year ahead of a profit target for its powertrain and interior divisions as global car sales advances outweigh development costs. The powertrain unit's earnings before interest, taxes and one-time items will be positive this year, one year earlier than originally planned, spokesman Hannes Boekhoff said, citing comments made by CEO Elmar Degenhart. The interior unit will have a “significantly positive” adjusted EBIT in 2010, he said. 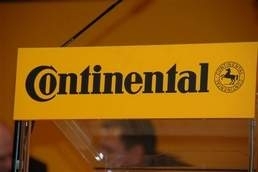 Continental's interior unit will reach an adjusted EBIT margin in early 2012 of 7 percent to 8 percent, while the powertrain unit will reach that target in 2013, Boekhoff said. Continental told Automotive News Europe in June that the powertrain division was seeing signs of a strong turnaround. "Our sales will be north of 4 billion euros," powertrain division head Jose Avila said at the time. The powertrain division, which competes again powerhouses such as Robert Bosch GmbH, Denso Corp. and Magna International Inc., had sales of 3.4 billion ($4.2 billion) last year, down 16 percent from 2008. The division reported an operating loss of 943.2 million euros last year. In 2008, the operating loss was more than 1 billion euros. The division spent more than 110 million euros last year to close plants, cut costs, pay severance packages and reduce capacity. The Hanover-based supplier's spending on the development of electric propulsion systems and turbochargers also hit the powertrain unit's profitablity since Continental bought Siemens AG's VDO car-parts unit in December 2007. A key reason Continental purchased Siemens VDO for 11.4 billion euros -- then the richest deal in the history of the supplier industry -- was to gain access to its German rivals powertrain expertise. The divisional profits would help the company in repaying about 8 billion euros in debt as it moves closer to merging with 75 percent stakeholder Schaeffler Group. The revised targets were first reported by the Frankfurter Allgemeine Zeitung today. Continental is scheduled to report third-quarter earnings tomorrow.